Cooking 4 all Seasons: Announcing Tried & Tasted Event! Announcing Tried & Tasted Event! When Lakshmi of Kitchen Chronicles mailed me to ask if I could host this month's edition of Tried and Tasted, I felt the tables were turned. There I was when this event started, waited couple of months with blatant breath in fear of being on the spot. Not that I wouldn't mind, mind you! But it is surely gave me a days of sleepless nights..:) Now I can say very happily that I can host this event without a fear! This is a blog event where a blog is chosen and all other bloggers are supposed to cook from the blog of the month. 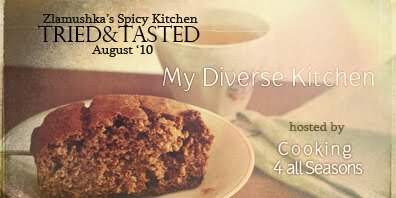 It is my extreme pleasure to choose Aparna's My Diverse Kitchen as the Blog of the Month! To be honest, I found it extremely hard to choose just one. I finalized on Aparna's simply because not only is she such a good friend, but she has such a varied collection which always made me want to try them. Her pictures really tempt you to run to your kitchen to make them right away, guess most times I am left admiring them instead of doing just that! So now is the right time, just browse through her collection, and simply cook away! Yay, Lakshmi must be wondering why I am yapping so much, let me get on with her rules! And please before we go on to the rules, there is a roll call for enthu hostess to come forward to host this wonderful event! It is open from November 2010. Please mail Lakshmi at venkateshlakshmi_7@gmail.com or you can leave a comment at her blog. And before that let me thank Ksenia of www.talesofaspoon.com for creating the logo for T&T every month. The logo for this month will be updated shortly once I hear from her. Thank you Ksenia! Now finally for the Rules! Have you cooked from Aparna's My Diverse Kitchen before? As this event is all about tasting and reflecting on the taste, older posts are also welcome. Simply link back to Aparna's post, this post and mention T&T event and Lakshmi's post. Please always link to both sites, so both blogs are given credit and you are avoiding copyright fuss. Feel free to use the logo. Email me your details with Subject T&T to Cooking4allseasons@gmail.com with your name, your post URL as well as the original URL and a picture. Deadline is 15th September and the round up will be posted within a week. Non-bloggers are more than welcome to participate (after all, our posts are mainly being written for them). Simply e-mail me with your experience of what you cooked and please include a picture. The round up will be posted during the first week in next month. Looking forward to enjoy a very diverse cooking!